The Grand Junction Rockies are headed back to the Pioneer League Playoffs after clinching their first playoff berth since 2013 with a 3-1 win over the Orem Owlz Wednesday night at UCCU Ballpark. 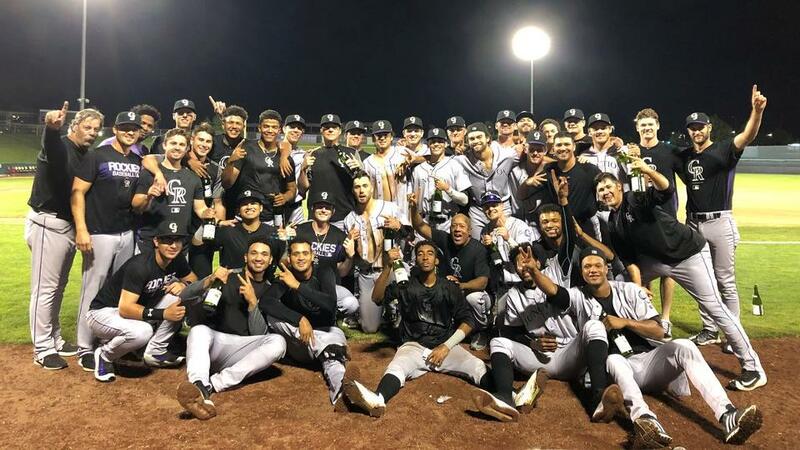 The win improves the Rockies to 23-14 in the second half, clinching the South Division's second half title setting the Rockies up for a South Division Championship Series matchup against the Ogden Raptors which will start Friday night at Lindquist Field. Orem took the lead in the fifth inning when Justin Jones doubled home Erven Roper, but on his 22nd birthday, Hunter Stovall tied the game in the sixth with his 10th home run of the season, and after a couple of walks, Niko Decolati put the Rockies on top with an RBI single. The Rockies increased the lead to two in the seventh when Cristopher Navarro followed Reese Berberet's double with an RBI single. Eris Filpo started for the Rockies and allowed just the one run over five innings. Will Tribucher retired all six that he faced in the sixth and seventh innings. Michael Agis ran into some trouble in the eighth after a walk and a single, but he got D'Shawn Knowles to fly out to center field, and Connor Fitzsimons to ground out to end the inning. Reagan Biechler closed the game out with a 1-2-3 ninth, striking out Roper to end it. Decolati finished with three hits, while Berberet and Grant Lavigne added two. Lavigne also walked twice, pushing his season total to 42, which is a club record. The Rockies will close out the 2018 regular season Thursday night in Orem. The first pitch is set for 6:35 and if the Rockies win they'll finish 2018 with the best record in franchise history.